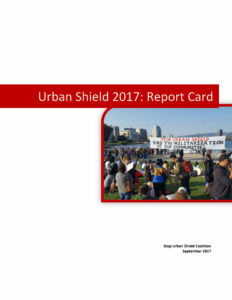 The Stop Urban Coalition has released a new report card assessing how Urban Shield 2017 fared in five main concern areas based on observations from people who attended the event. Additionally, the report looks at how well the weapons expo and SWAT training abided by 12 principles and guidelines that the Alameda County Board of Supervisors laid out in January 2017. The report card finds that Urban Shield dramatically fails in addressing community concerns. See the report card here.